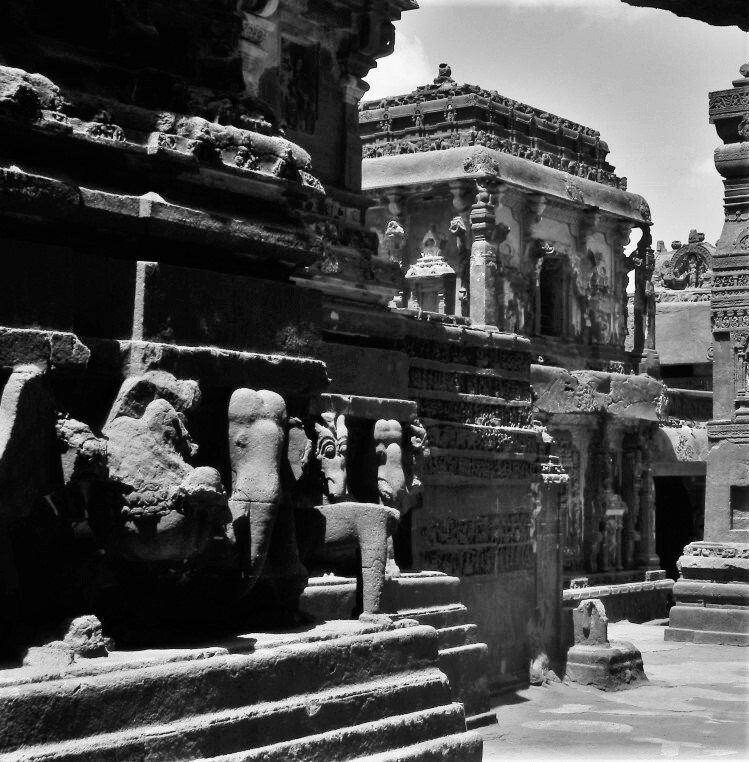 The rulers of Rashtrakuta dynasty were great patrons of art and architecture and were great builders and a half century of the Rashtrakuta rule, witnessed a very high achievements in the fields of sculpture and architecture.Now after more than a millennium, whatever remains, is in a dilapidated condition. Even then, the Ellora and Elephanta caves provide splendid examples of that era which excelled in carving out huge monuments and monolithic sculptures. In Ellora (in Maharashtra), we have rock-cut cave-temples of all faiths then flourishing in India Buddhist, Jaina, Shaiva and Vaishnava. Out of the 34 caves, 12 are Buddhist, (in the south) 17 are Hindu (vaishnava Shaiva and Shakta) and 5 caves on the Northern Side are Jain. • The features of the Rashtrakuta sculpture reflect the Dravidian Style. • The Features of Rashtrakuta sculpture are apparent in the rock out architectures. 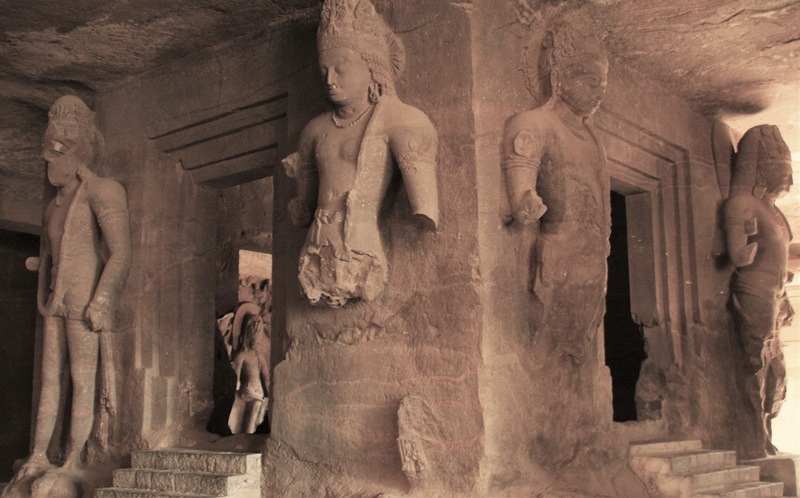 • The caves at Elephanta and Ellora nestled in Maharashtra bear testimony to the artistic wizardry of the Rashtrakutas. • The Sculptures that adorn the Monuments of the Rashtrakuta have been drawn from Hindu Mythologies. • The sculpture of Kasivisvesvara Temple is also worth checking out. This has also been built by following the vocabulary of the Rashtrakuta architecture. • The figure sculpture of dancers, musicians Gods and Goddesses from Hindu Puranas, nymphs and other are common on the outer walls of these rock cut caves. It is a marvelous piece of rock architecture and sculpture. It was built by the Rashtrakuta King Krishna I in AD 8th century. A complete hillside has been separated from a range of mountains and a huge temple has been excavated out of it. The main temple is supported on the back of elephants. These are on the island of Elephants near Bombay and were also built by the Rashtrakuta rulers. The Main cave temple belonging to the brahminical group of cave temples is dedicated to Shiva and is noted for its fine sculpture. The Temple has a large madapa supported on 20 pillars on the periphery. Flights of steps lead to it from the courtyards in front and at the back. The temple is famous for the huge Trimurti depicting the three aspects of the supreme creator, preserver and destroyer.